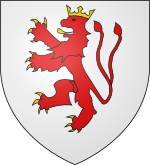 Waleran's new coat of arms, with a crown to symbolise his claim to Namur and two tails to symbolise his holding both Luxembourg and Limburg. 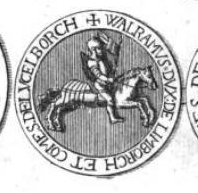 Waleran III (or Walram III) (c. 1165 – 2 July 1226) was initially lord of Montjoie, then count of Luxembourg from 1214. He became count of Arlon and duke of Limburg on his father's death in 1221. He was the son of Henry III of Limburg and Sophia of Saarbrücken. Waleran had four children by his first wife, Cunigunda of Lorraine, daughter of Frederick I, Duke of Lorraine, and three children by his second wife, Ermesinda of Luxembourg. ^ Gade 1951, p. 77. ^ Péporté 2011, p. 109-110. ^ a b c d Loud & Schenk 2017, p. xxix. Gade, John A. (1951). Luxemburg in the Middle Ages. E.J. Brill. Péporté, P. (2011). Historiography, Collective Memory and Nation-Building in Luxembourg. Brill.